Last week Woo-jin was dealing with being separated from Seo-ri forever, and this week the guy struggles with being apart for just twenty-four hours. With this brief separation, Woo-jin starts to realize how he truly feels towards Seo-ri, but he’s not the only one to do so. Chan starts putting the clues together as well, leaving Seo-ri as the only one left unaware of Woo-jin’s heart. Woo-jin and Chan both arrive just as Chan’s mother (Woo-jin’s sister) HYUN-JUNG encounters Seo-ri at the gate. Before they can formulate a lie or explanation, Hyun-jung offers them the perfect cover—Seo-ri is obviously the maid. Chan is quick to play along, especially when he hears that his mother will only be there for two hours before hopping on another plane, and drags his mom inside the house. Seo-ri is not so eager to play along with this ruse, but even Woo-jin nods in agreement in an effort to avoid conflict with Hyun-jung. Seo-ri’s efforts to leave the house are thwarted by Woo-jin, who escorts her back to the house. Inside, Hyun-jung notes that the house feels different. She looks around until her gaze settles on Seo-ri. “This can’t be right… is that really you?” she says, and heads for Seo-ri. “Is this really… Deok-gu?” Hyun-jung pets Deok-gu, who’s nestled in Seo-ri’s arms, and she comments on how much livelier the dog seems. Hyun-jung wants to catch up with the maid, so Chan drags his mother up to his room to see Chick Jr. Seo-ri wonders aloud at how familiar Hyun-jung seems, but she can’t place her. Hyun-jung is impressed with the maid’s impact on the house, even noting Jennifer’s spelling correction on Chan’s “Don’t Think, Feel!” sign. Chan makes sure that his mom can’t seek out Seo-ri by lying across Mom’s lap and promptly falling asleep, ha. It seems that Chan has missed his mother while she’s away. She notes the calluses on his hands, signs of his hard work. Her son asleep, Hyun-jung heads downstairs to finally get her chance to talk with the maid. She notes on her way down the formerly dying plant that has been revived, and Woo-jin proudly shares the secret to its new health. Seo-ri brings out fruit for Hyun-jung, but now it’s Woo-jin turn to intercept his sister by dragging her to his room. Hyun-jung braces for bad news, so she’s surprised when Woo-jin just asks her how she’s doing. He then goes on to gush about how well Chan is doing and how sweet and interesting his friends are. Hyun-jung looks on in wonder, recalling her brother telling her not so long ago how he hated strangers in his house. Hyun-jung spots the plunger and asks what it’s for. Woo-jin eagerly shows her the skylight trick and they climb up to look out on the view. Woo-jin is giddy about it, and this reminds Hyun-jung of a younger Woo-jin, who was excited to show her his latest drawing of the family. Meanwhile, the real maid Jennifer is having lunch with the young woman who intercepted her on the street. The woman notes the students she saw coming and going from what she believes to be Jennifer’s house, and asks if Jennifer got married. Jennifer softly responds in the negative. When the woman tells Jennifer she’s glad to see her, Jennifer shares that she thought that the woman would never want to see her again. Back at the house, Woo-jin and Hyun-jung head downstairs, and Chan wakes up and rushes down to see what he missed. It’s time for Hyun-jung to catch her plane, so all seems to have gone fine with their subterfuge. Seo-ri sneaks away upstairs, and Hyun-jung turns back to the stairs as well to grab her suitcase. There on the landing, Seo-ri retrieves a bandage for a cut she spotted on Hyun-jung’s ankle. Hyun-jung thanks her, both for the bandage and for taking care of her family. Seo-ri insists that she’s only been an inconvenience, but Hyun-jung just smiles at her. Chan wants to see his mother to the airport, but she reminds him of his “don’t think, feel” mantra and tells him to go practice instead. Chan gives her a big hug, telling her sorry and that he loves her very much, and Woo-jin starts the car for the airport. Chan is relieved that they were able to pull off their lie, but Seo-ri has reached her limits. She runs after the car, begging them to stop. Woo-jin pulls the car over, and Seo-ri confesses to Hyun-jung that she’s not the maid at all. Hyun-jung has two questions: Was Seo-ri the one who taught Woo-jin about the best spot for the plants, and was Seo-ri the one who showed him how to open the skylight? It’s evening when Woo-jin returns home, where he finds Seo-ri pacing in the yard. She asks what Hyun-jung said, and Woo-jin deadpans that his sister thought about it, and has asked Seo-ri to leave. Woo-jin lets earnest Seo-ri go on for a few moments before he confesses that he’s teasing her. And then he asks her why she confessed the truth to Hyun-jung, when it was only a two-hour lie. Seo-ri points out that even after the two hours, they would have had to keep up the lie with her. Not just that—she wasn’t a stranger, but Woo-jin’s sister and Chan’s mom, someone important to this family. Woo-jin gazes at her intently, and Seo-ri’s own gaze fixes back on him. As they stare, Chan returns and catches sight of the two. Chan hesitates, and then approaches to ask if his mom made it to the airport safely. Hae-beom and Deok-soo turn up with watermelon, and Jennifer arrives just in time to sweep the melons into her arms. The group of friends sits around the table, spitting watermelon seeds and catching them on their faces. Seo-ri gives it a try, but can’t find her seed when she opens her eyes. Woo-jin has found it though—on his face. Seo-ri rushes over to peel it off while everyone else laughs, and Jennifer starts taking photos. The group gathers around and they take cute group photos together. Woo-jin’s phone interrupts the fun with a call from Hyun-jung. Hyun-jung thanks Woo-jin for telling her the truth in the car. We flash back to the car ride, and Woo-jin confesses to Hyun-jung that Seo-ri isn’t the maid, but someone they needed to help. Just as Woo-jin began to drive away, it was at that moment that Seo-ri gave chase to the car to give her own confession. Woo-jin in turn thanks his sister for saying kind things to Seo-ri. Hyun-jung is just happy to see glimpses of her old brother back. And then she asks him, “You like that woman, don’t you?” Woo-jin stammers. Around four in the morning, Chan wakes up and notices that Woo-jin isn’t in his room. He goes looking for him downstairs and wakes up the rest of the household in the process. Woo-jin has even left his phone behind, but when Chan checks the closet, he’s reassured that his uncle’s clothes are still all there. It seems he hasn’t moved out suddenly, but there’s no indication of where he’s gone. Hours tick by, and still no sign of Woo-jin. Eventually, Jennifer encourages everyone to stop wallowing and to get on with their lives. Seo-ri makes it to work, but she is nervous and distracted. When Hee-soo points out that Seo-ri mistakenly purchased two copies of the same book, Seo-ri grabs the second copy and mumbles out that she’ll return it. Hyun jokes to Hee-soo that perhaps Woo-jin went off to live as a bigfoot again, but Hee-soo is pretty sure that he has reasons not to disappear suddenly. Halfway across a crosswalk, Seo-ri looks up and spots the missing Woo-jin on the other side. He smiles broadly and waves, while Seo-ri turns back and starts walking down the street instead of crossing. This announcement changes Seo-ri’s sentiments, but she’s no longer at a crosswalk to get to Woo-jin. She begins to sprint forward, until she and Woo-jin meet in the middle of a pedestrian bridge. Woo-jin says that he’s been to Jeju Island to talk to his dad about the house. He lists all the reasons why he can’t sell it: Chan needs a yard for exercise, Deok-gu does too, and Jennifer needs it to dry chilies. Seo-ri hushes him with a big hug, thanking him over and over. Woo-jin tells her that she can take her time finding her uncle and buying the house back. Woo-jin asks why she ignored him at the crosswalk, and Seo-ri scolds him, saying that he did the scariest thing he could do to her—disappear without a trace. Woo-jin promises that he’ll never disappear. Chan finally gets a call from his missing uncle, only to hear from Woo-jin that not only has he not run away, but that they’ll be keeping the house too. Chan is delighted, but he can’t help but wonder what that means for Woo-jin’s nomadic lifestyle. To answer, we get a glimpse of Woo-jin’s talk with his dad earlier in the day. Dad asks about the half of the year when Woo-jin would leave Korea, and Woo-jin tells him that he intends to stay in Korea permanently and take care of everything. His dad smiles broadly and says that of course they’ll keep the house. Woo-jin stops in to inform Jennifer of the news, and then it’s off to work. Jennifer, meanwhile, does a little cleaning dance of happiness with Deok-gu at the news. In the break room, Seo-ri spots a loose button on Woo-jin’s shirt. She grabs a needle and thread and starts to sew it back on. The pair’s faces are close, and they look up into each other’s eyes and then quickly avert. Just then, Hee-soo interrupts them. At the sound of her voice, Woo-jin and Seo-ri suddenly turn and break apart, Seo-ri’s hard head smashing into Woo-jin’s nose. Even so, Woo-jin isn’t mad, as he smiles sheepishly with tissue up his nose during their work meeting. He’s off this afternoon to get ideas for the classical program’s stage, and Hee-soo sends classical expert Seo-ri along to advise. Hee-soo takes note as Woo-jin grabs his things, and then decides to throw away his broken headphones on the way out. Aww Woo-jin, making progress. Tae-rin has decided to work with her old orchestra conductor for the performance, and Woo-jin and Seo-ri show up just as the orchestra finishes practicing. Seo-ri sets her notebook down on a music stand as she takes photos from all angles for Woo-jin. The conductor spots her notebook, with Seo-ri’s name written in big letters on it. He calls out her name, a question hanging in the air. Seo-ri quickly collects it from him and apologizes, but then turns back as she recognizes her old conductor’s face. In the back, Tae-rin watches them. Seo-ri recognizes her old conductor, SHIM MYUNG-HWAN, and he recognizes her as well. They escape to Conductor Shim’s office to catch up. He admits that he assumed that Seo-ri had recovered from her accident and gone on to Germany to study. He asks if she was playing at the workshop before. Seo-ri blushes that it wasn’t very good. The conductor disagrees. He admits that her technique is not what it once was, but her interpretation, resonance, everything else was just as good as he remembers. Conductor Shim asks if she’s given up music. Seo-ri says that she doesn’t expect to return to her old self, but she’s determined to play again. The conductor has an old photo of Seo-ri when she first joined the youth orchestra, which he gives her to keep. Tae-rin nervously paces in the practice room, stopped only by Woo-jin, who is there to grab his measuring tape. Tae-rin asks if Seo-ri is still talking with the conductor, and Woo-jin nods. Tae-rin doesn’t say anything further, but Woo-jin notes her nervousness. Tae-rin’s manager is outside in the lobby, trying to calm Tae-rin over the phone. He spots Seo-ri leaving Conductor Shim’s office, and recognizes her from the workshop. Seo-ri and Woo-jin go out for ddeokbboki afterwards. Seo-ri enters Woo-jin’s number on a raffle for free food. Woo-jin scoffs that no one ever wins those, but Seo-ri smiles and says that you never know. Woo-jin sees the edge of the photo Conductor Shim gave Seo-ri tucked into her notebook, and he tucks it in more securely. Aaah, so close! Seo-ri grumps about Woo-jin paying for lunch when she intended to treat him. Woo-jin says that she can give him the present he spotted in her pocket before when she was moving out instead. Seo-ri begrudgingly hands over the package, which contains new earbuds for Woo-jin. Seo-ri is embarrassed that the gift isn’t good enough, but Woo-jin says that he loves it. At home, Woo-jin is lost in thoughts of Seo-ri as he touches his repaired button. Chan catches his uncle daydreaming, and cutely says goodnight, and asks his uncle to dream of him. The next day, Woo-jin gets a text while he’s out working. He’s actually won the free ddeokbboki. He rushes back to the office to tell Seo-ri, but she and Hee-soo have traveled to a nearby island for a music festival. They’re supposed to catch the seven o’clock boat back, and Woo-jin spends his time watching the time. At seven on the dot, he’s disappointed by a phone call to the office that a storm has prevented Hee-soo and Seo-ri from returning that evening. Woo-jin calls Hee-soo himself immediately, but she can’t talk while she tries to find a room. Woo-jin arrives home just in time to catch Chan on the phone with Seo-ri. But as he runs at Chan to get a chance to talk, Chan misunderstands and hangs up on Seo-ri. Woo-jin pouts his way up to his room. Nothing is going right for Woo-jin, who can’t even seem to get the skylight window open. He finally gets a call from Seo-ri, but as he fumbles for his phone, he drops it under his bed and struggles to pull it out. He manages to press the accept call button, but while he can hear Seo-ri, she can’t hear him, so she hangs up. By the time Woo-jin fishes the phone out with the plunger, Hee-soo’s phone has run out of power and turned off. Chan asks to borrow his uncle’s extra battery, only to find Woo-jin distractedly painting his own finger instead of a figure. 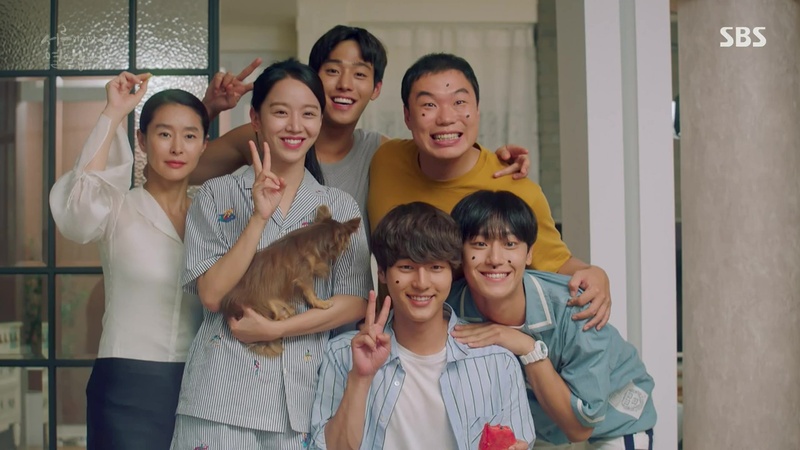 Woo-jin tells his nephew to help himself to the battery in his bag, but Chan finds something else there: the polaroid of Woo-jin and Seo-ri on the train. Downstairs, Jennifer receives a text from the mystery woman that reads, “I hope you can come that day. I’ll be waiting.” Jennifer stares down at her music box. Meanwhile, Hee-soo and Seo-ri sit down for some beer to pass the evening. Hee-soo comments on how many of Seo-ri’s first times, like drinking beer, she seems to be witnessing. Seo-ri says that she always imagined that she’d be a cool thirty-year-old like Hee-soo. Hee-soo scoffs and shares a secret: most of the time she feels just as young as she did in college. Hee-soo says that she doesn’t think that there’s anyone out there who truly feels like an adult. Seo-ri offers Woo-jin as an example, and Hee-soo laughs. Seo-ri asks how Hee-soo and Woo-jin got close. Hee-soo says that he’s always been cold, but she clung to him as the only other Korean abroad in her German program. But then Hee-soo pauses, and says that while she’s always known him to be cold, both Hyun-jung and Chan have told her that there was a time when Woo-jin smiled a lot. Hee-soo admits that she doesn’t know what it was that changed Woo-jin, but Seo-ri thinks of Woo-jin’s confession on the beach and wonders if that’s the cause. Hee-soo suggests that glimpses of the old Woo-jin have been turning up since Seo-ri came into his life, but Seo-ri doesn’t catch her meaning. Hee-soo’s phone is charged so she gives Seo-ri a moment to call Woo-jin. But Seo-ri is worried that Woo-jin is asleep and doesn’t make the call. Woo-jin, however, is most certainly not sleeping, as paces his room with phone in hand. He wants to call, but he’s also worried about disturbing Seo-ri’s sleep. Instead he looks on at his new headphones, and thinks back to the afternoon Seo-ri gave them to him. He asked for music recommendations, and Seo-ri begins to rattle off several rapidly. She finally lands on one suggestion, Erik Satie’s Je te veux. In her hotel room, Seo-ri is also still awake, her thoughts on their exchange. The next morning, Woo-jin wakes up early to see Chan off, as he heads to overnight training. He’s uncharacteristically caring, even hands over his credit card to Chan for food. Their exchange is interrupted by a call from Hee-soo, who is still stuck out on the island due to high winds. It’s looking like Seo-ri might not get home tonight either. At practice, Chan spots a young child playing a little too close to a watery overhang. He’s distracted, however, by his friends’ comments on the age gap of a celebrity couple. A splash turns his attention back to where the child stood, now empty. Chan spots the kid’s ball in the water and dives in after him. Chan rides with the ambulance with the kid to the hospital, while the neighbors go to tell the kid’s parents, who own the nearby flower shop, about the accident. At the hospital, Chan leaves with his friends and coach after he’s reassured that the boy will be okay. As he exits, a woman in a pink shirt brushes past him in a rush to find her son. She hovers over the rescued boy, and the camera pulls back to reveal Seo-ri’s aunt. Woo-jin stills pouts over Seo-ri’s absence. A student in the street asks him for the time, and he sullenly asks why it’s only 6:30. He hears someone call out, “Ahjusshi!” and assumes it’s the same student. But when he looks up, Seo-ri has made it back and stands on the other side of the street. “I think I do,” he says aloud in response. Seo-ri breaks first and ducks away for home. Her expression as she leaves, however, shows that she isn’t unaffected by the intensity of the moment. Chan hears from Hee-soo that Seo-ri has made it home. He also hears about the loose button and Seo-ri headbutting Woo-jin, a detail his uncle neglected to share with him. Chan calls Jennifer to talk to Seo-ri, but Jennifer isn’t at home, since she’s asked for some leave and will be gone until tomorrow. Chan then realizes that this means that Seo-ri and Woo-jin will be at the house all alone tonight. Seo-ri and Woo-jin come to that realization as well once they’re home. They bow formerly to one another over and over as they duck into their respective rooms. Chan is stuck at training with his feelings and the discovery that his uncle may have those same feelings for Seo-ri. Chan tries to run it all out as his mind goes over every clue he’s discovered lately, from the polaroid to the starry look in Woo-jin’s eyes. Back at home, Woo-jin gets a glass of water downstairs. His continued awkward moments with Seo-ri are interrupted by a huge moth that has made its way into the house. Woo-jin tries to shoo it out, and then he opens the doors and shuts off the lights to let it out. He and Seo-ri stand together in the dark, waiting for the moth to leave. In the glass reflection, Seo-ri can see Woo-jin’s intense gaze. Seo-ri turns to face Woo-jin. They each move in closer… and then part suddenly when the moth swoops in front of their faces. As Seo-ri stumbles back, Woo-jin grabs her and pulls up and even closer to him. Just kiss already! But truly, that was a great final scene, with all the great build-up and almost-moments I could ask for. While Seo-ri may have been in the dark about Woo-jin’s feelings, she certainly wasn’t unaware of her own, and I think that’s what brings a great balance to this episode and to the overall development of their relationship. No one has been stuck in that one-sided love place, where everything feels so much, while the other gets to breeze through unaffected. These moments are big for both Seo-ri and Woojin, and they’re very naturally coming together on equal terms. They each bring something that the other needs. Seo-ri has been busy fixing all the broken pieces of Woo-jin: his button, his headphones, and his heart. Meanwhile, Woo-jin is slowly learning how much it means to be person always there for someone else. Their need to be honest with Hyun-jung was really what sealed things in this episode. While the two started from very different places in this show, Woo-jin cold and Seo-ri childish and naïve, the two have met in their desire to take care of others by being open and honest. This shared value will likely become very important when Seo-ri’s identity is fully revealed. Woo-jin may feel misled when it all comes out, but anyone can see that Seo-ri is the type of person to be honest and open to a fault. It will be hard to place any blame on her, even those who are heart-hurt and in desperate need of someone to blame. I was worried we were going to get into some strange side story with Chan’s rescue of the young boy, but it turns out that everything is indeed connected. Seo-ri’s aunt is so close! Seo-ri has been so focused on finding her uncle, that she hasn’t considered that her aunt might be around and in a very different situation from before Seo-ri’s coma. Things looked murky for Seo’ri’s uncle the last time we checked in with him. He was lying about where he was to both Seo-ri and her aunt, and maybe caught up in something nefarious. So it might not be so surprising that Seo-ri’s aunt remains behind, even as her uncle is elusive. Is her aunt raising this boy alone? Is her uncle still around somewhere? I have a feeling that we’ll jump to a different mystery focus next week, so this will probably remain floating unanswered for a while. And perhaps the most important scene of this episode: Hee-soo speaks the truth anyone over thirty is thinking as they watch this drama. No one ever feels like an adult. Besides love and recovery, this idea serves as one of the show’s main themes. Seo-ri missed that natural progression from childhood to adult feelings of inadequacy, but that’s why we have Hee-soo to speak for us all. Thirty is just as bewildering as any other age.